Making clothes for little children is a satisfying endeavor. 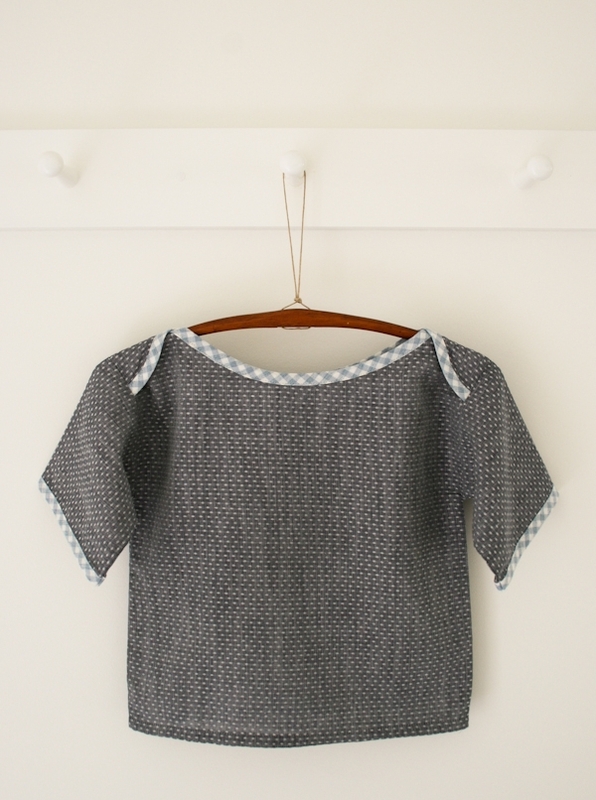 Kids look great in boxy shapes, so you can get away with omitting tricky details like darts. 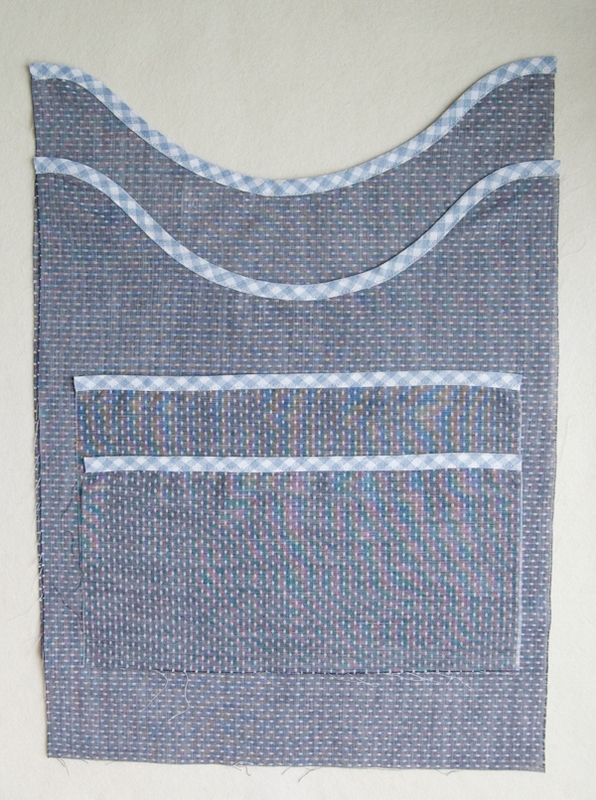 Additionally, and perhaps best of all, kids clothes are small by nature, so they don’t take any time to sew! 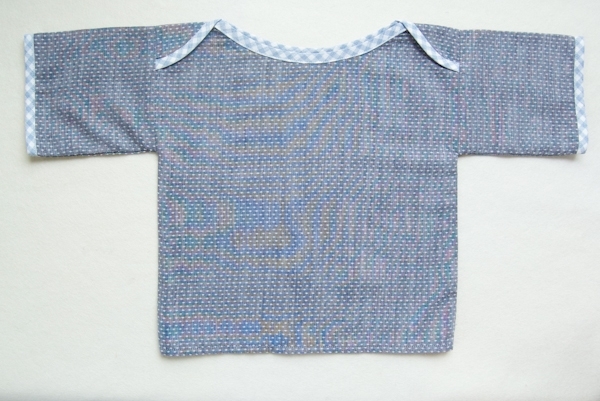 This sweet little Toddler T-Shirt, which will fit a 3 year old loosely and a 5 year old more snuggly, is elemental in its construction, just a simple T shape with a charming (and practical) overlap detail at the neck. 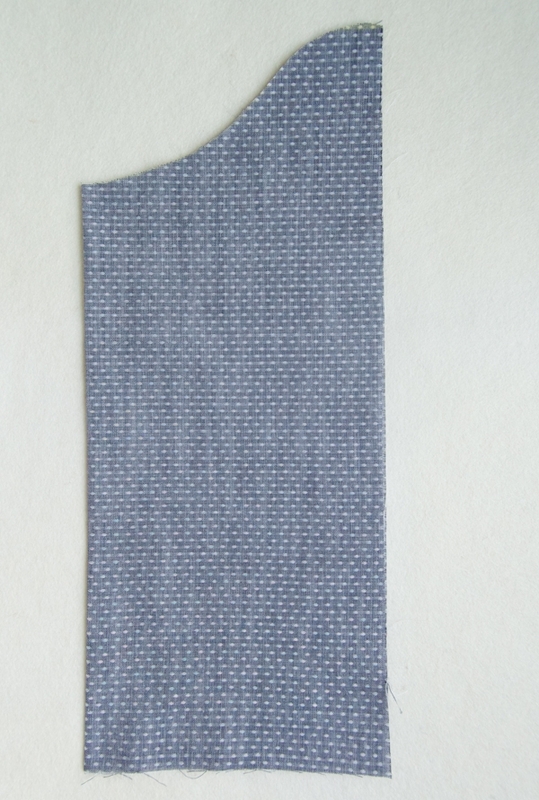 It’s made with gingham bias tape and Robert Kaufman’s extraordinary Dot Indigo from the Chambray Union collection. 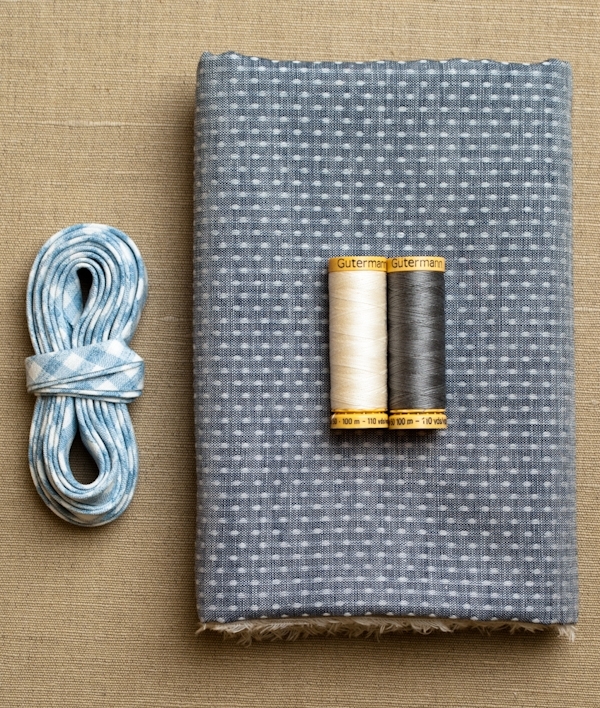 This woven fabric has a light, breezy feel and drape, as delightful to wear as it is to sew. All of the materials to make one can be found here in our handy kit! A Toddler T-Shirt Neck Template, printed and cut out. It is available to download for free here. Prewash and dry the fabric but not the bias tape. Cut two rectangles 14 inches wide by 17 inches tall. These are the Body Pieces. Cut two rectangles 6 inches wide by 12 inches tall. These are the Sleeve Pieces. 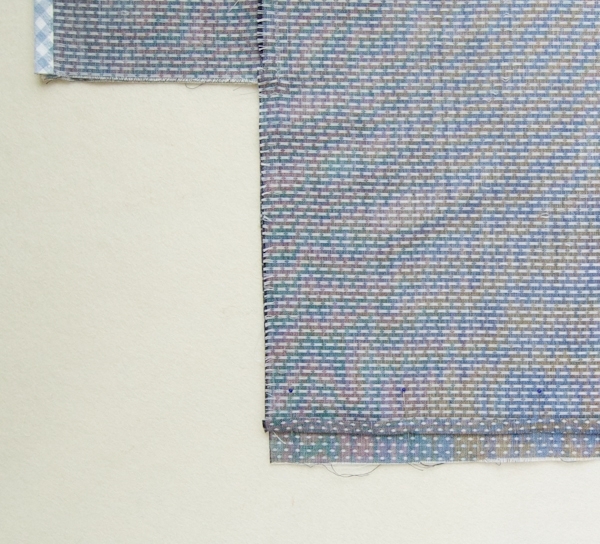 The dots on the fabric have a direction, so make sure to cut all the pieces with the dot pattern consistently oriented in relation to the length and width of the pieces. Press the Body Pieces in half lengthwise, wrong sides together, so that the 17-inch sides meet one another. Place the lower section of the Neck Template on the fold of one of the Body Pieces as directed on the template. The highest point of the neck template should go just to the top of the folded piece. Trace the template with chalk or a pencil and then cut along the traced line, which is the neck edge. Open the Body Piece and press it flat. Repeat for the second Body Piece. Pin the bias tape around the neck edges of both Body Pieces. Edgestitch it on with the matching thread, making sure to catch both sides of the bias tape. With the wrong side of one Body Piece facing up, use the fold markings on the Neck Template as a guide to fold the top left and right flaps down 2 inches. 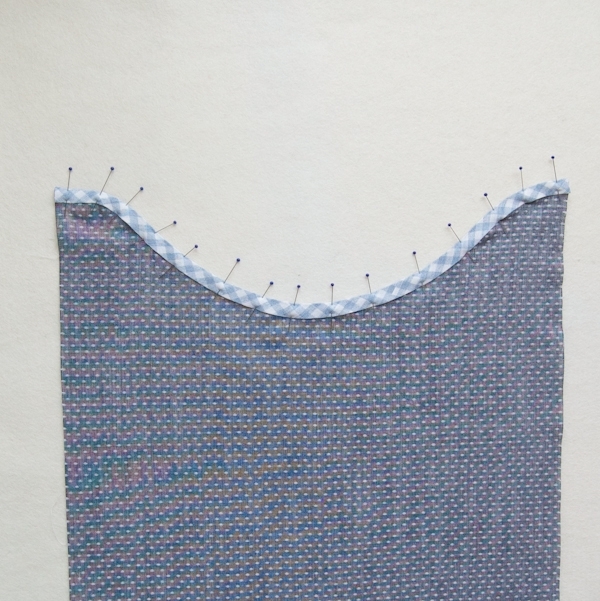 The right side of the fabrics should now show at the shoulders, as shown above. Press the shoulders down in this orientation to create a crease. Unfold the shoulders on both Body Pieces and lay one down right side up. Lay the second one down right side up but facing the opposite direction, matching up their shoulder creases. The curved edges now overlap one another. Pin the overlapping sections together along their raw edges. 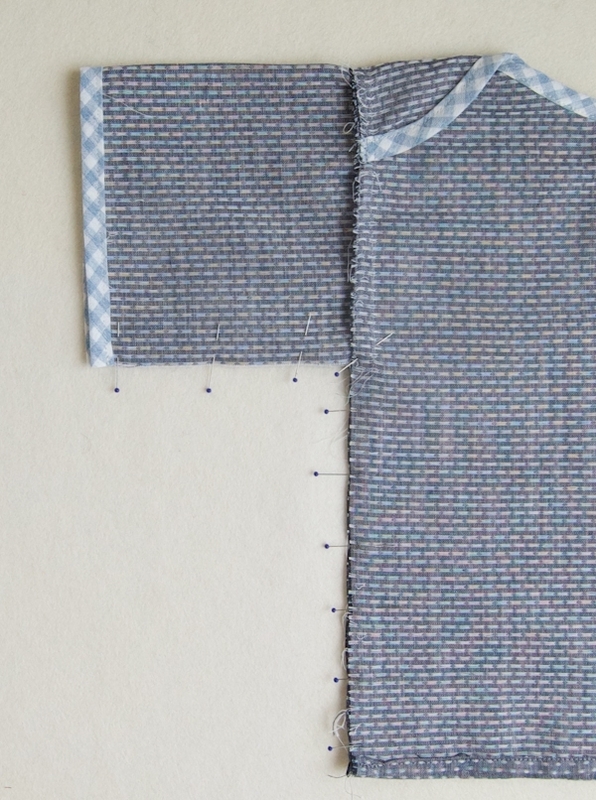 Using the thread to match the fabric, sew the pinned sections together along the raw edges with a ¼-inch seam allowance. This is now the Body. 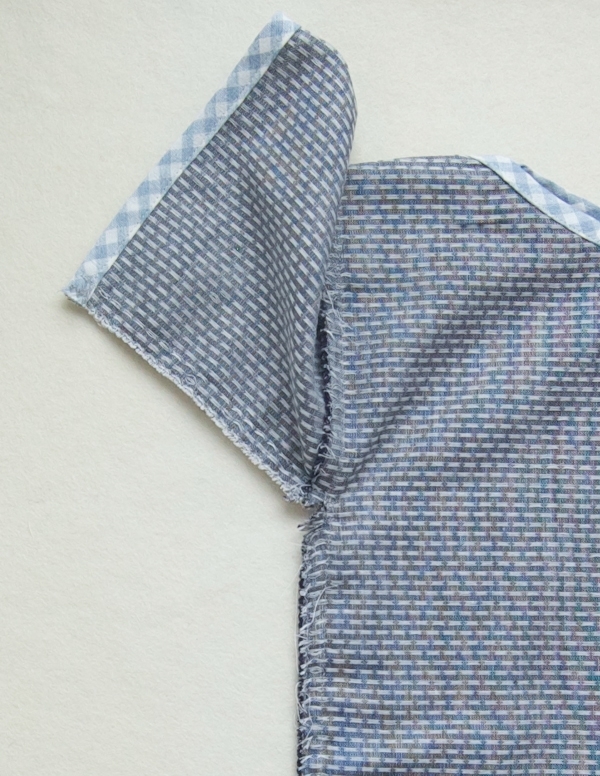 Fold one Sleeve Pieces in half widthwise so that its short edges meet. 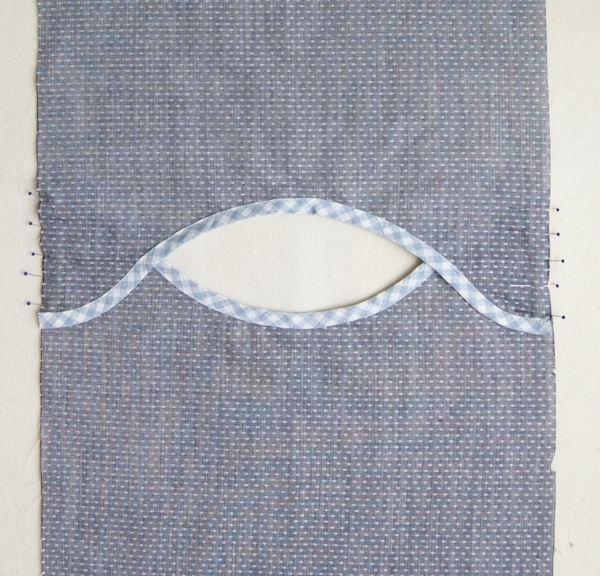 Press it to create a crease and then unfold..
Repeat for the second Sleeve Piece. With right sides together pin the long raw edge of a Sleeve Piece to a raw shoulder edge of the Body by matching up their creases. 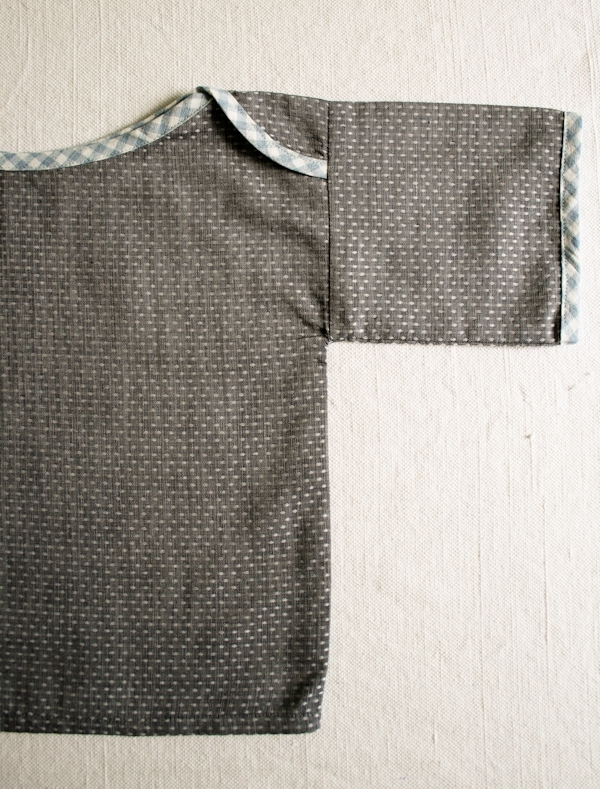 Sew the Sleeve Piece to the body with a ½-inch seam allowance. Repeat for the other Sleeve Piece. With the wrong side still facing out press the T-shirt in half at the shoulder creases so that the two short sides of the Sleeve Pieces meet as well as the bottom short sides of the Body. 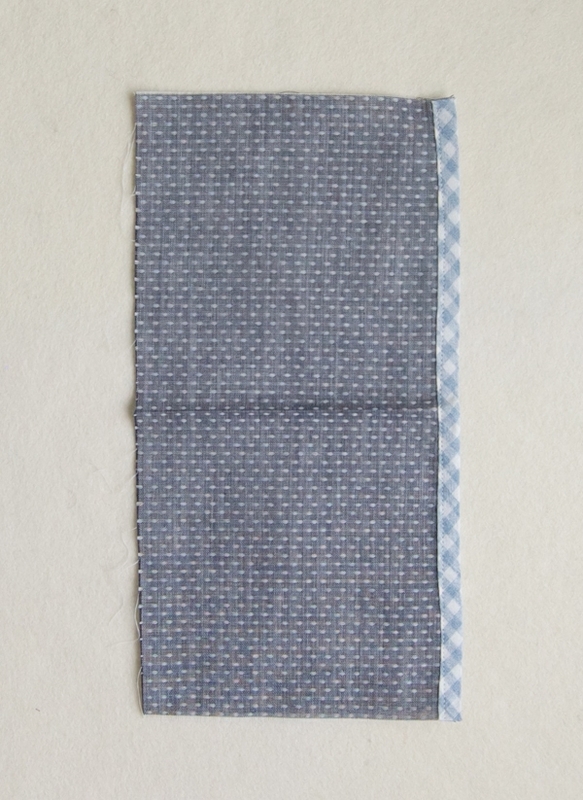 Press the bottom raw edge of one side of the Body up ¼-inch twice towards the wrong side and pin this hem into place. Edgestitch it down. Repeat for the opposite bottom raw edge of the Body, making sure that the two sides are exactly the same length. Pin raw edges together along the sides and sleeves. 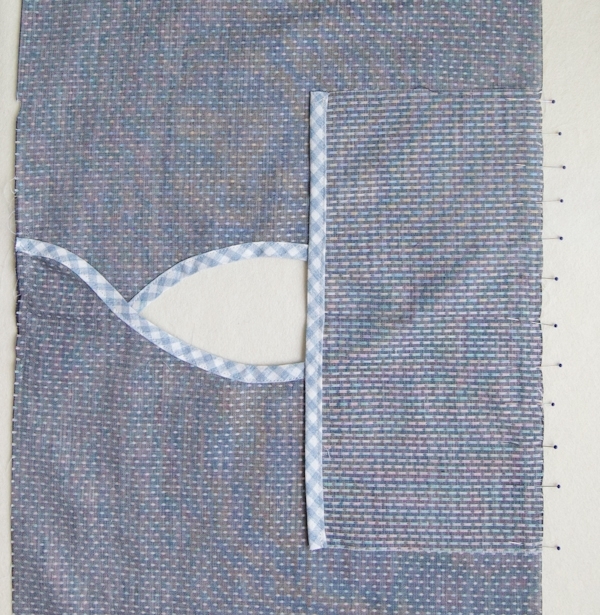 Using the thread to match the fabric sew the pinned edges together with a ½-inch seam allowance. Cut a few notches out of the seam allowance at the underarm. Zig zag stitch over the seam allowances to finish them. Turn the T-shirt right side out. The side with the visible shoulder curves , pictured above, is the front. Press flat and you’re all finished! Also, selling all of the materials needed to make the projects you feature is an amazing idea! I hope you will be doing it often! Definitely will be purchasing from you! You can read more about edge stitching here: http://purlbee.squarespace.com/the-purl-bee/2009/1/24/mollys-sketchbook-quick-dish-towels.html in the section titled "edge stitch twill tape." Basically, you are sewing on the bias tape just at it's edges. It takes a little bit of practice but once you get it down it's not hard! Just remember that you can always rip it out and start again! Thanks so much for your question and please let us know if you need any more help. Oh, my….what a wonderful little t-shirt!! !….and how it brings back memories of the simple clothes my grandmother used to make for me..this would be a great mommie and me (or in my case, grandmommie and me) project…. The shirt came out great and the model is adorable! Thanks for sharing! What sizes are in the pattern? This pattern is a child's size 4 but it's a pretty loose fit so it can probably be worn from ages 3-5. This is so cute. 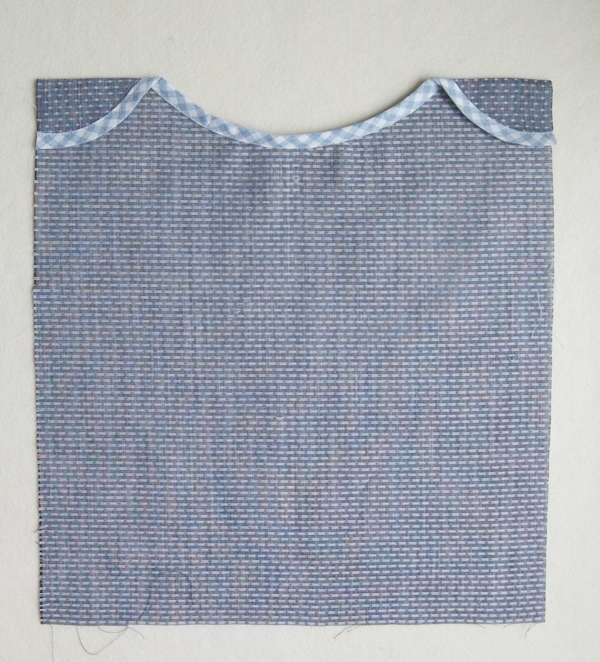 I have a question…do purlbee patterns (free) include seam or you have to add to the pattern? Thank you! This is adorable and I will be making it for my beautiful niece. For some reason, the PDF only has one page. Could you please check and let me know whether I am being a doofus?! The PDF is only one page, it's just for the curve of the neck. The rest of the pattern is listed above. Thank you for writing in and good luck with the project! Do you have a trick for how to scale it down to a 18-24 month size? 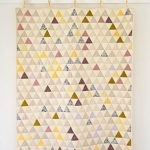 I love it the top and have a great stash of fabric and bias tape that could be perfect for this. I haven't tried to make this in another size but you might try shrinking down the whole pattern by 20%, (that's just a guess!) cutting one out of paper, and then comparing it to something that you know fits your 18-24 month old. Hope this helps! Thanks for writing in! 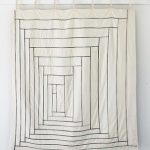 Does the fabric need to be stretchy or will it work without stretch? This is made from woven cotton which is not stretchy. 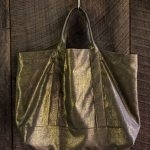 It will work with any light to medium weight woven cotton. Thanks so much for getting in touch and please let us know if you have any more questions! Thanks for this super cute project! Sadly, my link to the pattern download only has one page of the pattern template. Great question! The template itself is only one page. The remaining pieces are all rectangles. You will cut two rectangles 14 inches wide by 17 inches tall for the Body Pieces and two rectangles 6 inches wide by 12 inches tall for the Sleeve Pieces. 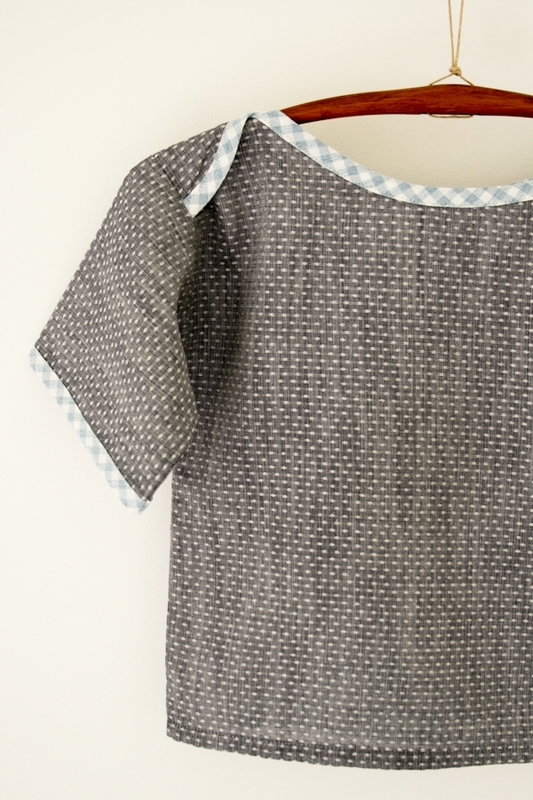 Together with the pieces from the template, you will have all the pieces that you need for this sweet little top! Hi! Would this cute top work for rayon? Hi and thanks for writing in! 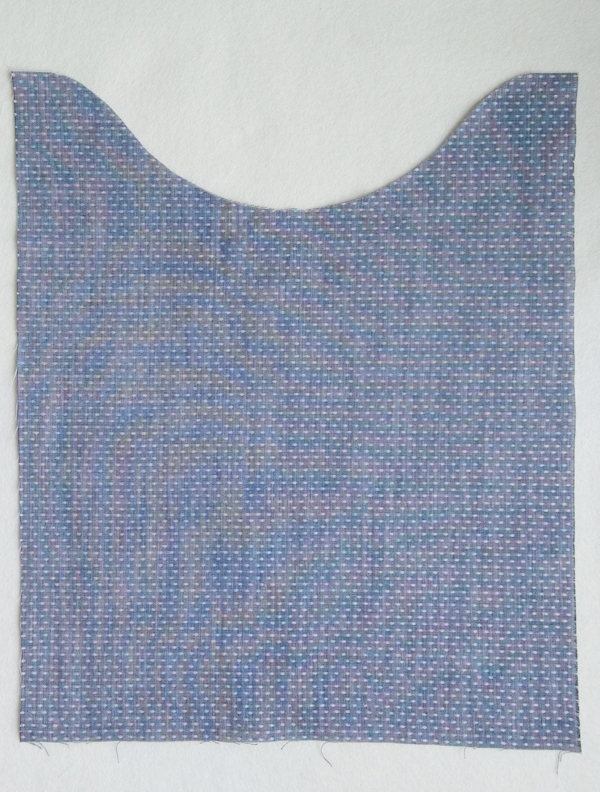 This top would work in any light weight woven fabric, including rayon!